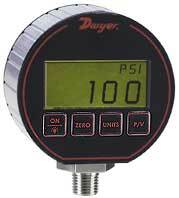 Replace your outdated analog gages with the new Series DPG-100 Digital Pressure Gage. The Series DPG-100 has a high ±0.25% full scale accuracy. The 4 digit digital display will reduce the potential for errors in readings by eliminating parallax error commonly produced with analog gages. Series DPG-100 is battery powered and has an auto-shut off to conserve battery life. Battery life, on average, will last 2000 hours. A 4 button key pad allows easy access to features without the need to work through complex menus or difficult key combinations. These features include backlight, peak and valley, tare or auto zero and conversion of the pressure units. Service: Liquids and non-combustible compatible gases. Housing Materials: Black Polycarbonate front & back cover, anodized aluminum extruded housing with recessed grooves, Polycarbonate overlay, Buna-N O-rings. 316L SS sensor construction. Accuracy: 0.25% F.S. ±1 least significant digit 32 to 130°F (0 to 55°C). (Includes linearity, hysteresis, repeatability.) ±2% F.S. @ 10°F. ±5% F.S. @ 0°F. Pressure Limit: 2x pressure range for models = 1000 psi; 5000 psi for 3000 psi range; 7500 for 5000 psi range. Enclosure Rating: Designed to meet NEMA 4/4X. Gage: 2 minute auto shut-off. Auto shut-off may be disengaged. Agency Approvals: CE, FM approved to be intrinsically safe for Class I, Division 1, Groups A, B, C and D, for ranges up to 3000 psi. *Model DPG-111 in not FM approved.